I made the JEB's Duro in homage to the Conway Stewart Duro, so it was only fitting that I borrow the name. The Conway Stewart Pen Company (CS) located in England, closed their business in October 2014. If you're not familiar with the company and their pens, they were a British company with close to two dozen different pen styles to their name. One of their tag lines was "they made the pens for the Queen". As a little side trivia, according to wikipedia.com, contrary to what many may believe,the name "Conway Stewart" did NOT come from the name of the founder of the company, but rather it was believed to be derived from a popular vaudeville act of the day. I've always been a fan of several of the CS pens. So after they went out of business and some of their original material became available, I decided to make a few pens based on some of their original styles. 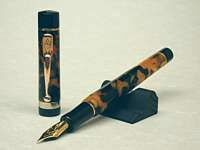 This pen is based on their DURO. CS had several versions of the Duro. The basic model used the same material for the entire pen, while another used a secondary (solid) black for some of the parts. Then once in a while they made a few Limited Edition (LE) pens that were again different from the others, usually made from a special material and/or used a higher grade of plating on the hardware. One of those LE's was called the "Tiffany Duro". It had an all black cap, black section, black barrel threads and blind cap, with only the center section of the barrel made from the featured "Tiffany" material. In this case the "Tiffany" was the name of a Casein material pattern. So named because the pattern is reminiscent of Tiffany glass. "Casein" is a type of material, which is a an early form of plastic-like material made from milk curd. The COLOR for this one was called YELLOW Tiffany. The supplier also has PLUM Tiffany, but couldn't find any CS pens made from it. The Plum has the same distinct Tiffany glass pattern, but has purple and white streaks with light blue highlights. The JEB's Duro is similar in size to the CS Duro (so when compared to many of my other pens, it's one of the smaller sizes). The length is a little longer than the CS Duro (about 5.75") because the barrel and finial are longer. On the CS Duro, the finial was shorter than the blind cap, which I didn't care for, so I matched the height of the finial to the length of the blind cap. The cap is the same length as the original, but the diameter is smaller .563"). The specs say the CS cap had a .59" diameter cap. It doesn't look that way in the photo's but I thought that was too large for the .50" diameter barrel, so I made it thinner. I couldn't find the length of their barrel, but based on the capped length and length of the cap, I think it was about 3". I always make mine 3 1/4" (not including the threads) because I think the longer barrel looks better, so that's where the rest of the length is. But the diameter is the same as the original (.50"). The only GLARING difference in the JEB's DURO is the clip*. Anyone that makes their own pens, knows how hard it is to find pen clips. I was hoping to find someone selling old CS hardware and getting some of their clips that way, but I never did. I had to settle for something different, so I went with a fairly straight style. As you can see the hardware was gold plated. Since it was an LE pen, they didn't make any with silver plated trim. *CLIP NOTE: I currently have a small supply of the original Duro/Churchill clips, so you can now order your pen with one of those original clips will the supply lasts. With the original clip, I'm also able to TAPER the cap so the cap style is the same as the original. So you can order your cap straight or tapered. The JEB's Duro doesn't allow (or require) many upgrades or options. But you could use your imagination and change up the color combination. 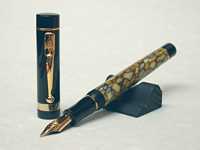 Maybe swap out the black for another solid color, or really change it up and make the entire pen from the same material. An easy upgrade would be changing up the stock C/C inking system for a button filler. Since the pen uses a threaded blind cap on the barrel for the band, the pen is prepped for the upgrade. You could also upgrade the stock steel nib with a 14k or 18k gold nib to make it really special. 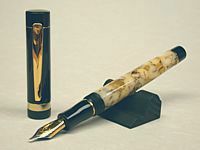 I also offer a variety of hand-made Pen Props and Pen Buttons, and Cuff-Links and Button Covers. 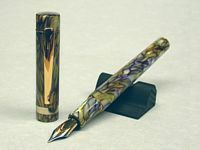 You can order a Pen Prop in the same material to match your pen, or any one of the wooden styles made in a variety of stained or dyed colors. The Pen Buttons are available for any of the clipless pens. The Cuff-links and Button Covers can also be ordered to match your pen. I have a variety of styles and finishes in the Cuff-links. The Button Covers are available in gold and nickel.